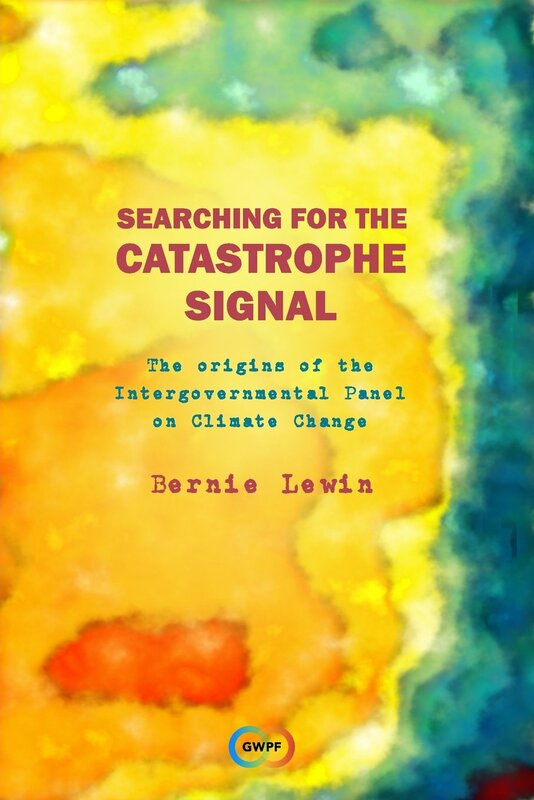 The detection of global warming and its attribution to the human cause had always been a task fraught with seemingly irreducible uncertainties. These had not subsided towards the end of 1995 when the pressure was mounting to deliver on political expectations introduced in the late 1980s. In a previous post we considered whether the Nov 1995 IPCC Working Group 1 meeting in Madrid was a tipping point in the corruption of climatology. Here we take a closer look at the science behind the ‘Chapter 8 Controversy’ in a longer essay broken into 2 posts (Part II here). Could this really be it? The first faint image of man in the sky? Ben Santer had just placed a transparency under the lens to project this colour pattern high upon the conference wall. It is the first afternoon of the Working Group 1 Plenary in Madrid, and this great council of nations from across the entire globe is persuaded to study the significance of its strange contours before getting down to their principal task. And so they should study it, for this is a game-changer striking at the nub of what the IPCC is all about. Although obscure, here is an image of the impact of human industry on the atmosphere above. At least part of the recent warming has at last been attributed to industrial emissions. If not for this, then why these near one hundred delegations flown in from all corners of the globe? There they are carefully positioned at arched rows of labelled bureaus across this cavernous auditorium. As they listen to live translations of Santer’s explanation, not a few of them must be gazing up in wonder: Could this really be what man hath wrought? The pace of Detection and Attribution (D&A) research in the early 1990s was such that the avant garde was evolving way ahead of, and out of pace with, the plodding progress of peer-review publication. Moreover, through 1995 it was becoming clearer that the science had advanced beyond the early drafts of the Second Assessment, from which was drafted the Summary for PolicyMakers and its Executive Summary. Not only was the research advancing, but a breakthrough had been achieved such that the human signal in the warming could now be observed for the first time emerging above the noise of natural variability. For the significance of this finding in the history of the IPCC, consider that back in 1990 Tom Wigley had submitted a draft of the First Assessment that was conclusive: The human impact on climate had NOT been detected. And so he was asked: How long before we can expect to see the signal? His response is recorded in the final section of the published Chapter 8. Given expected advances in modelling and another ½ degree of warming, attribution should be achievable. But this much warming is not expected for ‘a decade or more,’ and this assessment was repeated in the Rio Supplement of 1992 [FAR p253-4]. Wigley’s prediction turned out to be wrong because he did not anticipate the breakthrough in the research that was just around the corner. This breakthrough meant that the human signal could be seen even despite the pause in warming of the early 1990s. Most of the scientists involved in this advanced D&A work are on board as authors contributing to the new Chapter 8. Moreover, its co-ordinating lead author is also the lead author of the two most important recent papers delivering these D&A results, including the one that explains the significance of our ‘Mirror in the Sky’ above. So here in Madrid, at the final plenary of Working Group 1, Ben Santer is the man. Here is the man leading this advance in the science who is now explaining it directly to those who most needed to know. As Bert Bolin had just put it in his opening address, the Summary for PolicyMakers is ‘the scientist’s window into politics.’ And this is the meeting that serves to polish that glass. In fact, the first task for the conference is to polish the Executive Summary of the policymakers’ summary—those few pages that the policymakers back home are most likely to look through. The profound policy implications of the proposed updates to this Executive Summary is known to all, and so the idea is that once these advances in the science are explained, the Plenary will agree to seize the day, and incorporate them into a revised Summary. What is remarkable about this late intervention is that few people in the world, few scientists—even climate scientists—had seen this representation of the terrible distortion human industry had affected in the sky; few had seen it before Ben Santer places this transparency under the lens on the first day of Madrid. But by the time he finishes his talk the most important audience in the world evidently understands its significance. This is shaping up as the realisation of a spectacular communion of the most advanced science with inter-national governance—more than the scientist-founders of the inter-governmental panel could have ever anticipated—a marvellous triumph for the communication of knowledge to power, and, in every way, it is happening on a global scale. A marvel it might have been if it weren’t for those present at the conference with no interest in the message so communicated. One or two delegations with great stake in the continuing growth of the fossil fuel industry seemed to take every opportunity to push back, compromise, slow down, derail, and sabotage a consensus on this issue. And so the triumph at Madrid, later celebrated by Houghton—a triumph of science over vested interests—was challenged on every line, on every word that might so much as suggest attribution of climate change to the human cause. It had been a long journey to Madrid, and even when the word-by-word battle was over on that final desperate night—even when they had just managed to deliver that fateful phase, ‘a discernible human influence’—still the war was not yet won. We now know that the political war had only just begun. But the question for this blog is not about the politics, but about the science. Had it really triumphed here? Or had it got lost in the enthusiasm for some greater cause? Few of those familiar with the natural heat exchange of the atmosphere, which go into the making of our climates and weather, would be prepared to admit that the activities of man could have any influence upon phenomena of so vast a scale. In the following paper I hope to show that such influence is not only possible, but is actually occurring at the present time. Mean temperature anomolies, Guy Callendar, 1938. The dotted line marked ‘CO2 EFFECT ON MEAN’ gives partial attribution to CO2 emissions. So Guy Callendar began his presentation one Wednesday afternoon in the winter of 1938. He had been cordially invited to present his findings to a meeting of the Royal Meteorological Society. Although an amateur in this field, he proceeded to impress the experts with extraordinary learning and research into every aspects of the topic, bringing it all together in support of the conclusion that more than half of the warming over the last 30 years could be attributed to increasing ‘sky radiation’ due to industrial emissions of CO2. Early speculation that human industry emissions of CO2 might one day contribute some (welcome) warming was rejected at the turn of the 19th century when it was established that most of the wavelength bands of reflected heat blocked by CO2 were already blocked by (the almost ubiquitous) water vapour. These results were announced at the beginning of what is often regarded as the most sustained and widespread warming trend in the instrumental records of the northern climes. Now at the end of this period, a British steam engineer, Guy Callendar, had gathered some new data, revived the theory and announced that he had found in this warming a detectable human influence. Unperturbed by this polite rejection of his attribution theory—or perhaps driven by it—Callendar continued to gather more evidence illustrating the mechanism of the warming. But what he really needed if he had any chance of overcoming the scepticism of the entire meteorological establishment was to show some evidence of causation in the climate data itself. He needed to find evidence in the records that at least some of the recent warming was not entirely due to the natural ‘internal’ variability of climate, but that there was a general trend. And then he needed to somehow find a way to show that this trend was caused by emissions, and not by any of the other candidates for external climate forcing. Callendar did find a way, but not until the 1960s, and by then it was too late. Why this pattern analysis failed to gain traction at this time is unclear. Where Callendar was noticed by professional climatologist it was often with derision. Even after sending Keeling off to set up the monitoring station on Mauna Loa, Roger Revelle would not even let Callendar off first base, refusing to believe that CO2 could have increased as much as Callendar claimed (and as is now confirmed). Callendar’s book Climate and Carbon Dioxide was never published. Just how embittered Callendar was towards his critics is disputed, but perhaps it was the climate itself that had the last word. While the data in Callendar’s warming pattern analysis cut off around 1950, the article was not published until 1961, after which time it was hard to find any warming to analyse. In the early 1960s England was hit with a series of famously harsh winters, and in Fleming’s biography there is a marvellous photo, oozing symbolism, of Callendar shovelling snow after a blizzard in 1962. The following winter of 1963 was the one everyone remembers as The Big Freeze . One more winter and Callendar, with his global warming theory, was dead. By this time all the talk was about What’s causing the cooling? Then the cooling was off, and during the 1980s the popular anxiety was soon pushed the other way. Warming was now bad. And so, whereas CO2 emissions had first played the hero (warding off the next Ice Age), now it played the villain in a locus of controversy that had shifted (as had the funding) into the Manichean polity of the USA. Already in 1981 Revelle and Schneider were giving testimony to Congress, and a paper by the new head of NASA’s Goddard Institute delivered the first New York Times front page story for the Global Warming Scare. While these global mean temperature anomalies clearly show a warming trend, they are also used to support attribution to the human cause. The recent warming is so extraordinarily steep and extended by comparison with normal climate variability, so the argument goes, that it is extremely unlikely to be entirely due to natural climate variability. If there is no natural explanation then this supports the expected human cause. This kind of negative argument for human attribution is found in Callendar’s 1938 paper, and it appears again to support Hansen’s claim that there is only a 1% chance that the warming since 1975 is ‘accidental.’ This ‘accidental’ refers to the normal random natural variability which is established by Hansen as outside 3 standard deviations from the 1951-80 mean in the instrumental record. But this line of argument refused to die, and it re-appears again in the Second Assessment Report that was accepted at Madrid. The new Chapter 8 cites six studies published since the First Assessment finding a significant trend, and four other studies that find no significant trend. Behind claims of non-significance is the suggestion that the data show ‘a low-frequency cyclic component that is in phase with and explains most of the observed trend.’ The First Assessment had been much more explicit on this point, suggesting that we might be experiencing a continuation of the warming out of the Little Ice Age, back up into the realm of the Medieval Warm Period [FAR 7.2.1 p203]. In the Second Assessment such a natural explanation is no longer the null hypothesis. As an ‘alternative explanation’ it is rejected upon stronger evidence of computer simulated unforced natural variability [SAR p422b pdf]. The observed warming trend over the last 20 years, the last 25 years, 30 years…etc (solid line); these are all outside (above) the 95 percentile line of natural variability as determined by 3 computer models. [SAR p423]. The argument in the new Chapter 8 turns on an analysis of three climate models that unanimously re-establish Hansen’s conclusion by finding an ‘accidental’ probability below 5% for the warming since the mid-1970s. But not only since the 1970s! The warming from the mid-1960s, from the 50s, and for every time interval right back to the 1890s; these are all beyond the 95% percentile in the random distribution given by all three models. By the Third Assessment, global mean temperature hardly rates a mention in the D&A section (now Ch 12). When it does, there is a quick deferral to the Hockey Stick Graph (as paraded in Ch 2)—where the unprecedented nature of the warming is so visibly apparent it belies any trend analysis. But it helps us to reflect that already in the previous assessment we find presumed, or implicit, Hockey Sticks already shooting goals for human attribution. Whether low frequency cycles or long range trends, these are brushed aside in the uncertainty statements, or excluded from the conclusions, or obscured beyond a truncated shaft—like ‘warmest since 1400.’ It is no wonder then, that the Hockey Team were surprised by all the fuss when their graphically realised Hockey Stick appeared in the Third Assessment—however so much straighter and extended the proxy shaft and the instrumental blade. During the late 1980s the analysis of warming patterns was revolutionised on the one side by advances in computer modelling and on the other side by the availability of observational data. Improving time-series observations of the superficial and vertical patterns of change in the thermal structure of the atmosphere were now compared with increasingly sophisticated 3-D computer models, and these ‘pattern correlation studies’ dominated the renewed attempts to find the human ‘fingerprint.’ In fact, it was this quest for the so-called human ‘fingerprint’ that would eventually bring home the bacon for the D&A section of the IPCC Second Assessment. But success did not come right away. Despite what they might claim, and not just Hansen’s work, but all the studies in the late 1980s failed to detect the human ‘fingerprint’—at least according to the IPCC First Assessment: Tom Wigley had slapped a giant FAIL over each and every one of them. Hints of the breakthrough are already evident in the 1992 Supplementary Report, but it came just too late for the Earth Summit. At this time the D&A folks were already running simulations to give not just the warming impact of greenhouse gas emissions but also the localised cooling impact of the industrial sulphate aerosols pumping into the troposphere. Now the models began predicting more subdued warming—especially over the industrial north—and these results better resembled observations. Global mean temperature simulations now dipping at the peak of the post-war boom before sulphate pollution controls had an impact in the 1970s—a nod to the Little Cooling that was deeper in the north. More importantly, the zonal, regional and vertical pattern of the mixed human signal (CO2 + SO4) was now evident in the observations. But this human impact is not detected when Callendar claimed to find it. Rather, our Mirror in the Sky pattern at the top of this blog—the one that had such an impact at Madrid—this gives the warming since 1963. [Santer 1995b pdf, also Karoly 1994] That is, the signal only emerges from the depth of those harsh winters—the very year of the Big Freeze—that helped kill off human attribution the first time around. The rejection of earlier attribution is not entirely about diminished data. As the IPCC moved with increasing conviction towards human attributing of the later warming, it simultaneously moved to attribute most of this earlier warming to natural causes [see e.g., TAR p699]. And so, after the false start under Wigley, casting and recasting the argument on new evidence, the IPCC arrived at a consistent vindication of Hansen’s testimonial: the human signal is detectable, but only in the 2nd half of the 20th century. And this is perhaps why you still hear a lot about Hansen’s heroic (but dubious!) attribution argument, and why the pioneering work of Guy Callendar is left out in the cold. Yes Callendar was an outsider, but he also cuts a dismal figure shovelling snow off the human warming theory while it lay buried in the ditch of the Little Cooling. 1. For a window into the increasingly well funded US climate science in the early 1970s see ‘What’s Happening to Our Climate?,’ Nat Geographic Nov 1976, Vol 150, #5 p576, and also Weart’s History. This entry was posted in Climate Change Science, History of Climate Science and tagged Dr Ben Santer, IPCC Working Group 1, Madrid 1995. Bookmark the permalink. ← Madrid 1995: Was this the Tipping Point in the Corruption of Climate Science? This sycophantic rant is not worthy of the term “skeptic”. The real skeptic critique has obviosly not been consulted. That was the year the late Dr. Dwarka Das Sabu and I were ambushed at the National Meeting of the American Geophysical Union in April 1976 for reporting experimental evidence our elements were made in the Sun, and ejected from the Sun five billion years (5 Gyr) ago. After a long delay, our conclusion was finally published in Science  confirmed by many subsequent measurements, including the Galileo Probe of Jupiter in 1995 , and CSPAN captured on film the NASA Administrator (Dr. Dan Goldin) ordering the belated release of Jupiter data in 1998 . 2. “Isotopic ratios in Jupiter confirm intra-solar diffusion”, Meteoritics and Planetary Science 33, A97, 5011 (1998).